Fats are macro nutrients i.e. nutrients that we consume in large amounts and give us energy. Each fat molecule is made up of one of the three fatty acids: saturated, unsaturated or poly unsaturated fatty acids. “Saturated” here implies number of double bonds i.e. saturated acids have no double bonds, unsaturated acid have one single double bond and poly unsaturated acid have two or more double bonds. Saturated fatty acids are majorly found in meat, dairy products like butter and cream. Saturated fat tends to get accumulated in the fat cells. 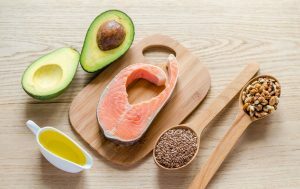 Increased consumption of saturated fats can lead to obesity which might increase the cholesterol levels which in turn increase the risk for heart ailments. A genetic variation in certain genes influences the effect of saturated fat intake on obesity risk. Unsaturated fatty acids are majorly found in nuts, vegetable oils and fish. Triglycerides is one of the main constituents of vegetable oil. Triglyceride levels in the blood are determining factors for heart health. Genes has a vital role in maintaining triglyceride levels. Variations in this gene have been associated with an elevated triglyceride level (referred to as hypertriglyceridemia) which is considered as a major contributing factor for increased risk of health conditions including heart ailments (like coronary heart disease). 100andlife’s DNA assessment can help you understand your genes responsible for weight gain and obesity and provide necessary recommendations to be fit and healthy.